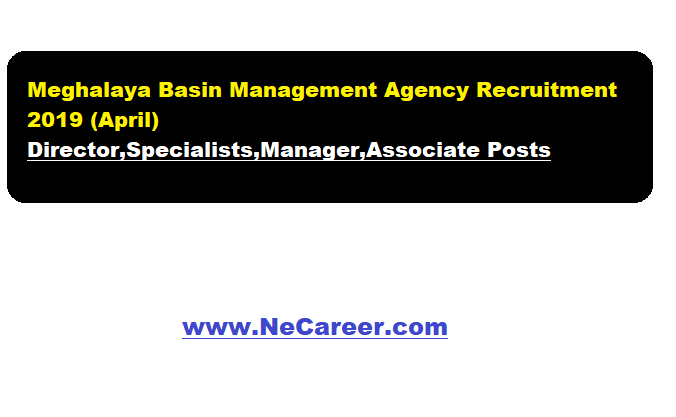 Meghalaya Basin Management Agency Recruitment 2019 (April) - Director,Specialists,Manager,Associate Posts:- Welcome to North East India's No. 1 Job Portal NeCareer.com . Today we will going to inform you about a new job vacancy in the state of Meghalaya. 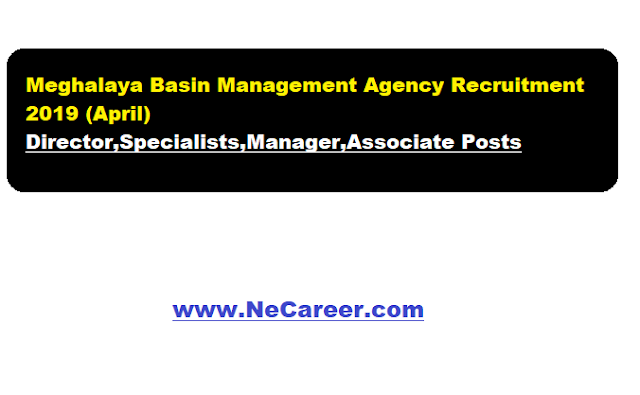 Meghalaya Basin Management Agency (MBMA) has published a recruitment notification in April 2019. According to the recruitment, MBMA invites application in prescribed format for filling up various vacant positions on contractual basis.Find more details in below sections. Essential Qualification: Candidates must be Graduate or Post Graduate or equivalent in Natural Resource Management, Natural Resource and Governance, Resources Engineering, Environmental Studies, Forestry, Environmental Management, and Environmental Engineering or other related fields. Required Experience: Minimum 10 years of relevant professional experience in implementation of natural resource management, environmental management and livelihood improvement or climate change adaptation or landscape management projects. Essential Qualification: Candidates must be Post Graduate an equivalent in Anthropology, Sociology, Applied Social Science, Environmental Science or other related fields. Required Experience: Minimum 7 years of experience in relevant operational areas like a social safeguard, social assessment, and social development issue. Essential Qualification: Post Graduate or equivalent in Environmental Science, Earth Science, Forestry, Natural Resource Management or MBA in Environment Management or B.Tech in Environmental Engineering and Management or B.Tech in Energy and Environmental Engineering. Required Experience: Minimum 7 years of work experience in relevant operational environmental management and natural resource management issues. Preferably with experience in rehabilitation of degraded forest, land, water and soil management. Essential Qualification: Candidates must be Graduate or Postgraduate or equivalent in Agricultural Science/ Engineering, Natural Resource Management, Environmental Science, Hydrology, other related fields. Required Experience: Minimum 7 years of relevant professional experience in soil and water conservation management and planning. Expert in implementation of programs, policies for improving environmental habitats, wetlands, or groundwater or soil resources. Essential Qualification: Candidates must be Graduate or Post Graduate or equivalent in Water Resources, Geology, Environmental Science, Hydrology and other related fields. Required Experience: Minimum 7 years of relevant professional experience in water resources, agriculture water management, and natural resource management projects. Essential Qualification: Candidates must be Post Graduate or equivalent in Forestry, Forestry Management, Apiculture, Ecology & Environmental Science having in-depth knowledge and experience in forest management or restoration. Required Experience: Minimum 7 years of work experience in active forest management a restoration and natural resource management issues. Preferably with experience in rehabilitation of degraded forest, land, water and soil management. Essential Qualification: Candidates must be Post Graduate or equivalent in Social Sciences, Development Studies, Social Work Rural Development or other related fields. Required Experience: Minimum 7 years of relevant professional experience in Community & Rural Development Of related areas. Preferably with experience in rural & community development/ rural livelihood/ social entrepreneurship/ value chain/ agribusiness development. etc. Essential Qualification: Candidates must be Graduate or Post Graduate in any disciplines. Preferably in MSW/MBA in Project Management, Development Studies, Social Science, Engineering or related disciplines. Required Experience: Minimum 7 years of experience in a supervisory capacity in implementation of rural development project management/ business management /rural livelihood implementation/ social entrepreneurship/ value chain/ agribusiness development. At least minimum of 5 years experience in project management or relevant domain. Essential Qualification: Candidates must be Graduate or Post Graduate in Mass Communication & Journalism, English, Development Studies, Natural Resource Management, Economics, Social Science, Public Policy or related disciplines. Required Experience: Minimum 5 years of experience in knowledge management in the field of rural development or international/national development projects Proficient in the documentation, research, and communication process. Essential Qualification: Candidates must be MBA in Human Resource Management or Post Graduate in Personnel Management or Post Graduate Diploma in Personnel Management & Industrial Relations or Post Graduate Diploma in Human Resource Management (PGD-HRM). Required Experience: Minimum 3 years of hands-on experience in EPF process & Payroll Management with in-depth knowledge in HR statutory and compliances. Essential Qualification: Candidates must be Graduate or Post Graduate in Commerce. Accountancy OR BBA or MBA in Financial Management, Accounting & Finance. Required Experience: At least 1 or 2 years of experience in accounts. taxation, and financial management with good knowledge in the chart of accounts or accounting procedure. Essential Qualification: Candidates must be Post Graduate in Environmental Science, Earth Science, Forestry. Natural Resource Management or MBA in Environment Management after B.Tech in Environmental Engineering and Management or B.Tech in Energy and Environmental Engineering. Required Experience: At least 1 or 2 years of experience in environmental and natural resource management projects Preferably with experience in rehabilitation of degraded forest, land, water and soil management. Essential Qualification: Candidates must be Graduate or Post Graduate in Sociology, Social Science, Social Work. Social Development, Anthropology with including courses in gender within the degree. Required Experience: At least 1 or 2 years of experience in social development operational areas, social safeguard assessment and gender equality. Presentation are essential for all position. For position Sl. No. 2 to 13 the age limit is 22 to 45 years. Interested eligible candidate may apply in prescribed Application form duly filled along with self-attested credentials should only be submitted to the O/o Meghalaya Basin Management Agency, C/o, Meghalaya State Housing Cooperative Society Ltd. Campus, Nongrim Hills, Shillong, Meghalaya - 793003. OR at the O/o the Basin Development Unit (BDU)/ District Project Management Unit (DPMU) located in the O/o the Deputy Commissioner of the 11 districts. Notification and prescribed application form can be downloaded from the website, www.mbda.gov.in or can be obtained free of cost from the O/o Meghalaya Basin Management Agency, C/o, Meghalaya State Housing Cooperative Society Ltd. Campus, Nongrim Hills, Shillong. For the outstation candidate, the duly filled application form and documents should only be submitted via e-mail to recruitmentmbda@gmail.com clearly indicating the name of the position in the subject line. Last date for receipt of applications is 25th April 2019 (up to 5.00 p.m.). Application received after the last date will be not be entertained and MBMA will not be responsible for any kind of postal loss or transit delay. There will be written test and personal interview for all positions. Written test will comprise of Subject Matter Knowledge, General, Knowledge, Reasoning, and English. For position Sl. No. 11 (Programme Associate –Finance & Account), the Written Test/ Personal Interview will be held in Tura. For position Sl.No.1 to 10, 12 and 13, the Written Test/ Personal Interview will be held only in Shillong. Advertisement No:- MBMA/CLLMP/HR/64/2018/74 dated on 8th April 2019.